Another C2E2 has come and gone, and now it’s time to report back from what is technically Chicago’s only comic convention (the other ones are in a suburb). 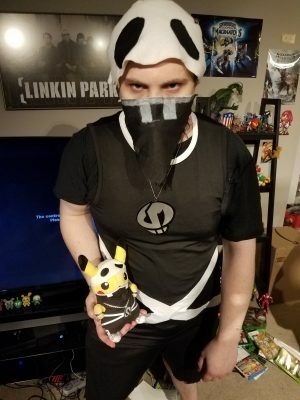 This year, I donned my Team Skull uniform, grabbed my buddy Pikachu, and headed over to McCormick Place to check out the festivities. Video games had a larger presence than usual this time around, so there was a lot of ground to cover. Too much for just one writer, in fact; make sure to check out Cody’s coverage as well. The first thing I did at the convention was meet the voice actor behind my favorite video game character. My love of Skylanders is well known, and I did get a chance to speak with the voice actor behind one of my favorite characters from that game too, but my favorite video game character is actually Blanka from Street Fighter. 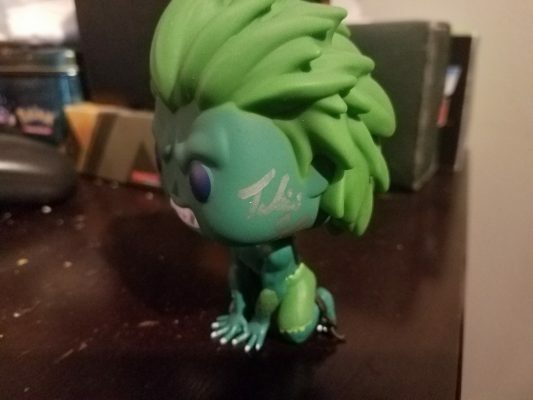 His voice actor Taliesin Jaffe was on hand along with the rest of the cast of Critical Role, so I took advantage of the opportunity to get my Blanka Funko Pop figure signed. He was really cool, and he liked my costume, so I left happy. Another thing that caught my eye at the convention was a large booth on the show floor for MassVR. 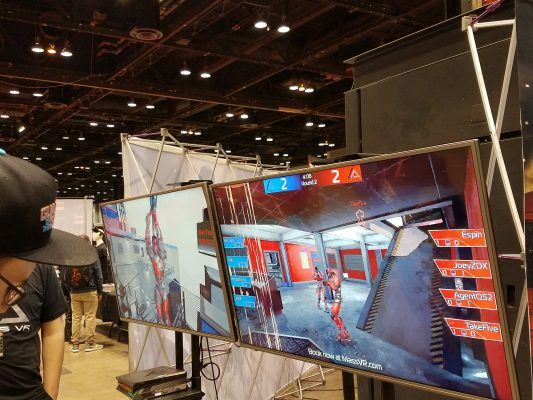 This company had set up a huge area for a 4-on-4 VR shooter using room scale technology such that you never have to move with the controllers; the room and the in-game setting are exactly the same size. While I didn’t get a chance to try it out myself, I did get a good look at their impressive set up. They told me they were using modified Oculus Rift systems, with the additional hardware in backpacks to keep things wireless. That’s just as well; any viewer of the TVGB ViveStream can tell you I’ve run into trouble with VR cables for just one person, let alone 8. The game itself looked very polished, and everyone seemed to be having a lot of fun. 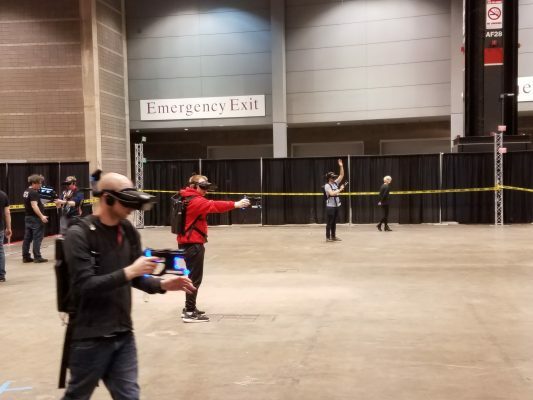 But the company representatives told me that for the full true MassVR experience, I would need to check out their permanent location near O’Hare International Airport. I might just take them up on that for a special episode of the ViveStream. 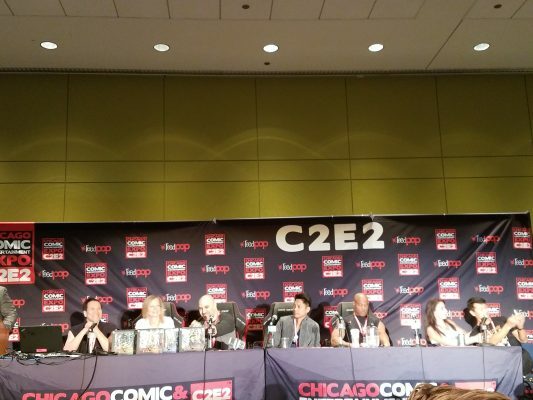 When it comes to video game-related content at C2E2 though, the biggest thing for me was the Mortal Kombat panel. As you probably know, the original three games in the series used actual photos of real people in costume to represent almost all of the characters. Or actually, I should say they used videos; the actors and their moves for the first two games were actually recorded on VHS. That’s just one of the many interesting facts I learned at this panel from cast members of the original three games. Present were Phillip Ann (Shang Tsung), John Parrish (Jax), Katalin Zamiar (Kitana), Anthony Marquez (Kung Lao), Elizabeth Malecki (Sonya Blade), Richard Divizio (Kano/Baraka), and perhaps most notably, Daniel Pesina (Johnny Cage and the ninjas). It was amazing to hear about just how little was planned ahead of time for the characters and story of the Mortal Kombat series. Most of the actors from the original game already knew each other; they all went to the same gym, the former Lakeshore Athletic Club here in Chicago, and some of them even played D&D together. The first one to be brought in by creator John Tobias was Pesina, and he later helped recruit the others. Pesina further explained the origins of one of his most popular characters, Johnny Cage. He explained that the character was not based on Jean Claude Van Damme, as rumor would tell you, but actually on an existing character. He referred to the character being from a movie, but he also mentioned the Marvel character Iron Fist/Danny Rand, so it’s possible he got some wires crossed. Either way, that’s quite an inspiration. More interesting, though, was what he said about how the character’s moves were determined. Pesina recounted that at the studio, Tobias basically told him, “You’re Johnny Cage, a Hollywood actor. Do something cool.” That was pretty much how the characters and their moves were determined for the first couple of games. Even some of the game’s most iconic features came from the actors trying things out. For example, Pesina himself brought in Scorpion’s famous rope dart, a weapon actually used to get riders off of their horses. As he recorded throwing it, Divizio shouted “Get over here!” as a joke, and the rest is history. As a point of interest, Kitana and Mileena’s weapons were also the ones that Zarniar already knew how to use. The actors who debuted in the second game each came into the project from different places, but they were all recruited because they already knew the original actors. As an example, Parrish had been working out with some of the other actors, and wasn’t really familiar with the game at all until Pesina brought in the console version. Parrish noted the lack of any black characters, and soon enough, Pesina came back to him with a picture of Jax. Parrish recalls asking, “THAT guy is ripped. Who’s going to play him?” The response was, of course, “You are.” That was about all the preparation he had. Jax’s metal arms in the third game came in part from Parrish as well; he suggested Jax should have some sort of super power like the rest of the cast. The metal arms were actually achieved through paint, and it ended up requiring a lot more than they had initially planned for. The black lines on the arms, in turn, were drawn on with a Sharpie. Even the series’s signature Fatalities were largely figured out on the fly. Kano’s heart-ripping fatality was inspired by Indiana Jones and the Temple of Doom, for example. Originally Divizio had Kano eat the heart, but John Tobias nixed that idea. Divizio was also responsible for the reveal that Scorpion was actually a skeleton in his fatality, which he suggested when Pesina noted that he couldn’t do the fire breathing without taking off his hood. And while it was actually Pesina’s idea, Malecki noted that she is a big fan of Sonya’s “kiss of death” fatality, which became the character’s signature. There were plenty more anecdotes that I’d love to share, such as Ann actually being a doctor, but I can only fit so much in one post. So I’ll leave you with the answer to the question I asked the panel: the origin of my favorite MK mainstay, Reptile. During the filming session, Tobias had asked Pesina to film some extra moves that would be used for characters they hadn’t decided upon yet. The idea for Reptile as a character randomly came to Ed Boon in a KFC drive-through, believe it or not. When the second game came along, the character’s acid-spitting ability was inspired by the character of The Lizard in the old Amazing Spider-Man cartoon. Such is the surprising nature of one of the most notorious franchises in video game history. I learned way more than I expected to from this panel, and it was definitely a highlight of the convention for me. I was really happy to see how much video game-related content was present at the convention this time around, and I hope this continues in future years. While C2E2 is a relatively small convention, it’s always a ton of fun, and this year was no exception. Now, we just have a year to wait until the next one!